The University of Wyoming School of Pharmacy was founded in 1946 under the leadership of Dr. David W. O'Day. The School was originally located in the basement of Merica Hall. By 1962, the School (then the College of Pharmacy) occupied the entire building. By 1949, Merica Hall was designated the Merica Pharmacy Building, but then renamed Merica Hall after the School of Pharmacy was moved to the newly constructed Pharmacy Building in 1969. The School of Pharmacy is now a part of the College of Health Sciences Center. The school's beginnings were tied to a deliberate expansion of university offerings by UW President George Duke Humphrey, who led the university from 1945 to 1964. According to the book Wyoming University: The First 100 Years, 1886-1986, "Programmatic expansion began immediately after the war. As early as September 1945, Duke Humphrey called on deans and department heads to present to him in writing summaries of their immediate needs and future plans." In addition to proposing a new College of Pharmacy (now the School of Pharmacy), the UW president spearheaded creation of a College of Commerce (now the College of Business), School of Fine Arts (now part of the College of Arts and Sciences), a School of Home Economics (part of the College of Agriculture), and programs in forestry and veterinary science. Both UW's history and the pharmacy school's history were dramatically affected by the termination of World War II and subsequent return of soldiers to civilian life. In the mid-1940s, UW's expansion efforts were bolstered by the influx of many former GIs who enrolled as students under the new GI Bill, designed to assist WW II veterans with education and training upon their return from service. Founded in 1946 - The University of Wyoming School of Pharmacy was organized in the fall of 1946 as a unit in the College of Liberal Arts. Dr. David W. O’Day was appointed head of the School of Pharmacy and Assistant Dean of Liberal Arts. Thirty-one students, 27 men and 4 women were enrolled with 23 classified as freshmen, 6 as sophomores, and 2 as specials. 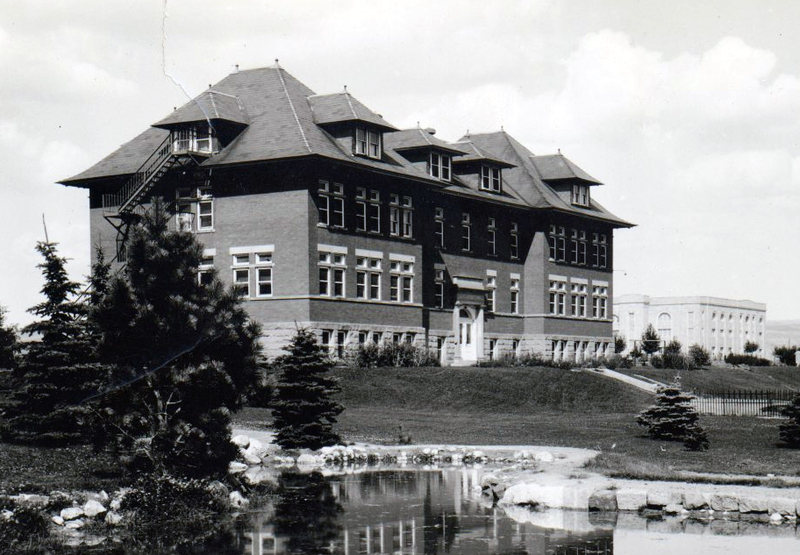 Only the first year of the four-year curriculum was offered during the 1946-1947 fiscal year. The School of Pharmacy had two faculty members, including Dr. O’Day. 1947 - The School of Pharmacy moved into the basement of Merica Hall (later designated Merica Pharmacy). During the 1947-1948 year, the first and second years of the curriculum were offered. 1948 - The School of Pharmacy was established as an autonomous unit of the University in 1948. The administrative head was a dean and Dr. O’Day assumed the position. 1949 - In 1949, the name School of Pharmacy was changed to College of Pharmacy. The College occupied the basement and the first floor of Merica Pharmacy. The entire four-year curriculum was offered for the first time Fall 1949. 129 students were enrolled in the four years. 1950 - June 1950 saw the first class graduate with 23 graduates - 21 men and 2 women. The four-year curriculum was accredited by the American Council on Pharmaceutical Education. The College occupied the basement and the first two floors of Merica Pharmacy. 1960 - The five-year curriculum became effective in 1960. The College of Pharmacy’s five-year program was accredited by the American Council on Pharmaceutical Education. 1962 - In 1962, the College of Pharmacy occupied the entire Merica Pharmacy building. 1966 - Dean David O’Day retired in 1966 and Dr. Jack N. Bone became the Dean of the College of Pharmacy. 1968 - The University of Wyoming established the College of Health Sciences in 1968. The College consisted of the School of Pharmacy (name change from College of Pharmacy), the School of Nursing and the Division of Paramedical Sciences. Dean Bone remained the Dean of the School of Pharmacy and assumed the position of Dean of the College of Health Sciences. 1969 - The new School of Pharmacy building was occupied in 1969. 1972 - The clinical pharmacy program was started in 1972 with the hiring of Robert D. Scalley, Pharm.D. 1975 - Enrollment in the five-year pharmacy curriculum Fall 1975 was 280 students; 28 preprofessional, 53 first professional, 71 second professional, 74 third professional, and 54 fourth professional. Graduates totaled 45 - 32 men and 13 women. The School of Pharmacy had 11 faculty members. The history of developing the clinical program at the University of Wyoming is a vital part of the school's past and a key element in making the program as successful as it is today. Dr. Robert Scalley was hired in 1972 to create the Clinical Pharmacy Program. He has kindly contributed the following article regarding the history of the Clinical Pharmacy Program, how it was developed and the role it has and is playing in the school's success. Dr. Scalley retired from the UW School of Pharmacy in September 2013 following 41 years of hard work, loyalty, and dedication to the school. In the early 1970s federal money was available to pharmacy schools for the development of "clinical programs." At this time, a few schools offered the Doctor of Pharmacy (Pharm.D.) degree but most did not and the standard five-year baccalaureate curriculum included very little, if any, experiential coursework. In August 1972, Robert Scalley, the first clinical faculty, was hired to develop clinical coursework which would eventually be incorporated into the existing curriculum. At this time, faculty and staff consisted of: Jack Bone (Dean), Duane Anderson (pathology), Emery Brunett (dispensing), Edward Julian (pharmacognosy), Norma Jochumsen (administration), Raymond Kahl (medicinal chemistry), Devendra Madan (chemistry), Kenneth Nelson (medicinal chemistry), Robert Nelson (pharmacology), Eleanor Noble (preparations), Betty Anderson (secretary) and Ray Pantier (animal keeper). The first clinical courses were electives. A didactic course was offered fall semester with follow-up "clerkships" spring semester. During the clerkship, half the time was spent at Ivinson Memorial Hospital and the other half in community pharmacies in Laramie. These elective courses were eventually incorporated into the pharmacy curriculum. Presently, students complete four-week experiential rotations and the term clerkship is no longer used. Accreditation requirements would eventually mandate that all students would complete experiential coursework and it became evident that expansion of the clinical program would be required. Opportunity to expand into Fort Collins, Colorado, was offered by Clifford Stuart the director of pharmacy services at Poudre Valley Hospital. Stuart was an alumnus of the University of Wyoming and was interested in becoming affiliated with the school’s new clinical program. Thus, in 1975, expansion of the clinical program began in Fort Collins under the direction of Robert Scalley. In 1974, Jimmy Harelik was hired to teach the clinical courses in Laramie and in 1975 Joseph Steiner was hired to expand the clinical program into Casper, Wyoming. Expansion into Cheyenne occurred in 1977 with the hiring of Carolyn Zehnle. This period also saw the emergence of university- and community-based family medicine residency programs in Wyoming and Colorado. The residency programs provided opportunity for advanced pharmacy practice for ambulatory- and hospital-based clinical faculty. Faculty became role models for students who were provided opportunity for direct patient care activities. Pharmacy faculty became educators of family medicine residents and faculty. This model, combining family medicine and pharmacy, was eventually expanded to additional sites. The initial clerkships were eight weeks in length and utilized hospital and community pharmacy sites. Hospital pharmacy clerkships were the model for the current internal medicine rotations. Clinical faculty assigned to sites were responsible for not only the hospital rotation, but also the coordination of community pharmacy sites. In 1974, the initial elective didactic course was increased to three credit hours and became a required (core) course. In 1979, this course, 680D Introduction to Clinical Pharmacy (Therapeutics I), was expanded to four credit hours and followed in spring semester by the three credit hour 681D Therapeutics II course. In 1982, 687D Clinical Pharmacy for Pharmacists was offered. This course was designed to "provide clinical pharmacy education to pharmacists who have not had clinical pharmacy in their academic programs." In 1993, 5140 Pharmacotherapy for Primary Care was offered for the nursing program. This course was designed to "prepare primary care practitioners in drug therapy management for a variety of client populations with an emphasis on rural practice." 1996, the Doctor of Pharmacy curriculum began. The present curriculum includes seven didactic courses taught by clinical faculty representing 19 credit hours. In addition to the traditional therapeutics, the curriculum also includes physical assessment, pharmacy practice laboratory and clinical pharmacokinetics. During the fourth professional year, three one-week Reflective Learning courses are required. In preparation for the Doctor of Pharmacy curriculum, further expansion of experiential sites occurred in Scottsbluff, Nebraska, Greeley, Colorado, and the Denver, Colorado, area. Additional clinical faculty were hired to develop these sites. Many alumni will remember faculty subsequently assigned to these sites. With the beginning of the doctor of pharmacy program, Lauren Thompson was hired in 1996 as Experiential Coordinator. This provided a full time person to develop and coordinate all community sites supervised by adjunct faculty (preceptors) and to begin the preceptor development program. Importantly, from the point of view of the clinical faculty, responsibility for community pharmacy and hospital pharmacy rotations was transferred to the Experiential Coordinator. Subsequent individuals holding this position included Jeffrey Bernard, Cara Harshberger and, most recently, Antoinette Brown. Janelle Krueger was hired in 2005 to develop early experiential courses. Spring semesters of the first and second professional years now include 6170 Introductory Pharmacy Practicum and 6270 Intermediate Pharmacy Practicum respectively. Both are 1 credit hour courses. Also included in the early experiential curriculum are two 4 credit hour rotations, 6480 Introduction to Community Pharmacy and 6482 Introduction to Institutional Pharmacy, which are offered summer semester following the first professional year. Krueger now holds the position of Director, Experiential Education Program. With the implementation of the doctor of pharmacy program, four-week experiential rotations were developed in a variety of settings. During the fourth professional year, nine rotations are required, each providing 4 credit hours of instruction. Five rotations are mandatory: 6470 Internal Medicine I, 6471 Internal Medicine II, 6473 Ambulatory Care I, 6481 Advanced Community Pharmacy and 6483 Advanced Institutional Pharmacy. Numerous elective rotations are available. The school’s Drug Information Center (DIC) was initially developed by Linda Gore in 1975. This was based on some earlier survey work by Robert Scalley exploring the use of drug information resources in the State of Wyoming. Kendra Grande was hired to direct the DIC in 2004 as Linda assumed faculty responsibilities. The DIC is presently under the guidance of Melissa Hunter. In the early 70s, traditional pharmacy programs began development of clinical programs. Most clinical faculty had earned the Doctor of Pharmacy degree and many had completed a general pharmacy practice residency. Unfortunately, clinical faculty were not always considered equal partners with traditional graduate school educated faculty. This was the case at Wyoming as well as across the country. This was intimidating because the early clinical faculty held tenure track positions. Fortunately, the majority of faculty at the school were supportive and the clinical program flourished. Clinical and adjunct faculty are now responsible for 69 credit hours of instruction (47 percent of the total curriculum). Presently, there are 19 clinical faculty, 16 faculty pharmacy practice sites and approximately 150 adjunct faculty pharmacy practice sites. Nationally, the success of clinical faculty in academic administration is evident as 49 percent of ACPE-accredited pharmacy programs are led by individuals with a Doctor of Pharmacy degree. Development of experiential sites for faculty pharmacy practice and student learning continues to be a challenge as competition for teaching sites increases among existing and new pharmacy programs. Recruitment and retention of faculty, both clinical and basic science, also continues to be a challenge.